Woman Up came to us for creative direction, the week before Women’s History Month began. We wanted to hero women that redefined what it means to be a woman. A woman doesn’t have to live up to any gender roles, pressures, or stereotypes. Because no one can define a woman, only a woman can define herself. Co-leading with Megan Plevy, we were responsible for the entire creative direction for the month. 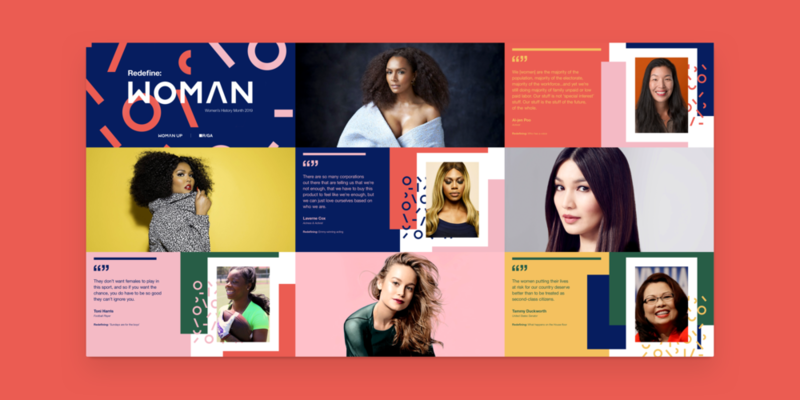 We concepted and created assets for all the US office screens, R/GA’s Instagram campaign, Women’s History Month events, emails, and R/GA bot messages. We even put on a screening of the movie Roma, and launched a slack channel called #rgawatching (100+ members) to discuss the film live. For centuries, there were few ways to define a woman. A way to act, look, speak, and be a woman—and only so far a woman could go. But the reason we’re having this conversation is you can’t define a woman, a woman defines herself. So this month, we’re bringing to light people who have redefined, in their own right, the women they are. Whether it’s the pioneers hidden in history, or the next generation cracking the glass ceiling. All voices deserve to be heard. For anyone who identifies as woman, from any background, race, ethnicity, and sexual preference. For all those who go against the “norm,” break roles, and define their own. We invite you to Redefine: Woman.